DANCKERTS - Tabula ITALIAE Corsicae, Sardaniae, et adjacentium Regnorum. . .
DANCKERTS, D./ TAVERNIER, D. - Tabula ITALIAE Corsicae, Sardaniae, et adjacentium Regnorum. . .
Tabula ITALIAE Corsicae, Sardaniae, et adjacentium Regnorum. . . - DANCKERTS, D./ TAVERNIER, D.
Title : Tabula ITALIAE Corsicae, Sardaniae, et adjacentium Regnorum. . ..
Map maker : DANCKERTS, D./ TAVERNIER, D.. Size : 14.8 x 19.1 inches. / 37.7 x 48.4 cm. 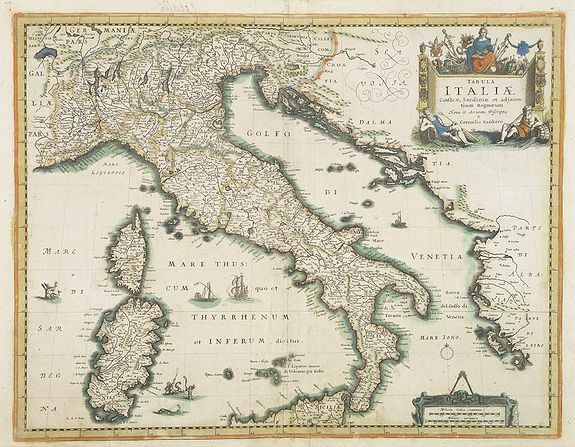 Description :An extremely rare map of Italy, including Sicily and Corsica. The map is copied by Cornelis Danckerts II after a map by Henricus Hondius. This map is found only in French composite atlases and the map was likely made for the French market. Cornelis Danckerts has worked for Melchior Tavernier in Paris. In the first half of the 17th century many Dutch maps where included or re-engraved for the French market. Condition : Paper slightly age-toned, repair of split center fold.